Ship Speed Rule: Right Whales Win! 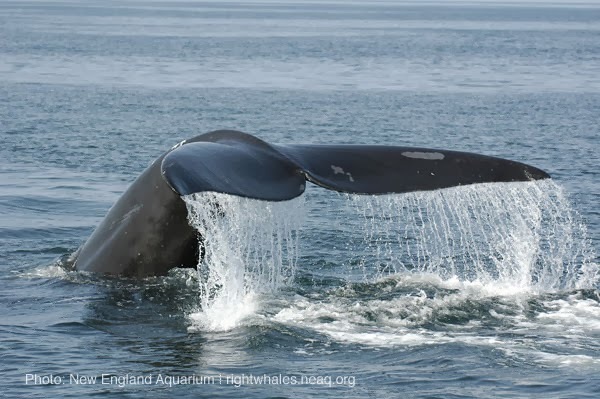 Today, the right whale community breathes a sigh of relief and rejoices in a wonderful gift: the elimination of the "sunset clause" in the ship speed reduction rule. Conservationists, scientists and organizations pulled together this year to rally support to encourage the federal government to remove this expiration date from the rule. The fact that it was accomplished is major reason to celebrate! What is this ship speed reduction rule and why are we so excited by its continuation? Because right whales spend time at the surface and are slow moving, they are no strangers to vessel collisions, particularly in the southeast U.S. where mothers birth and nurse their newborn calves. The faster a ship travels, the more likely they are to strike and kill a right whale. Implemented in 2008, the crux of this rule requires vessels of 65+ ft in length to slow down to at least 10 knots in designated areas on the East Coast at certain times of the year when right whales are most likely to be present. Models predicted that this rule would reduce the probability of fatal ship strikes of right whales by a whopping 80-90%! And it's proven to have made a difference: "no right whale ship strike deaths have occurred in Seasonal Management Areas since the rule went into place" (from NOAA). However, these measures were only temporary and set to expire in December 2013. It was scary to think that this rule could cease to exist— with a current estimated population of only 510 individuals, removal of these speed restrictions would have been taking several steps backwards. Fortunately, the rule now exists in perpetuity!! Many people have worked tirelessly to ensure that this rule continues to exist, but we must also remember that (to quote Amy Knowlton) "the shipping industry is to be commended for complying with this rule that has clearly made a difference for the North Atlantic right whale." The final rule is available here! I agree and felt really bad when they showed up in MA from FL last year. They've been displaced, possibly from BP tragedy and there is nothing more sad that taking my daughter on my favorite childhood whale watch, to see square finned whales. There was a petition at South Stationback in 2008 or so and I am so glad I wrote a check!! I do hope there is visibility into the shipping industry and enforcement. Hello! I would like to echo the comment below (March 28, 2014), in that this movement of the whales from MA to FL is natural. There was an unusual occurrence in January 2013 when Wart (#1140) appeared in Cape Cod Bay with a calf, but we don't feel this was a case of displacement. Thank you for your concern though, and for supporting conservation efforts! Great news! With 510 left... it is critical! Thank you all for working so tirelessly to make sure this rule became permanent. I hope it continues to prevent collisions between ships and whales. I would like to point out, as a response to the comment from Anonymous on 1/3/14 that the whales were not displaced, but they migrate. They spend their springs and summers in the northeast feeding and breeding and many travel to the southeast U.S. in the wintertime, especially the pregnant mothers to give birth in the warmer waters. This is normal for North Atlantic right whales. To my knowledge, there is also no evidence that the BP tragedy in the Gulf of Mexico has affected this population at all. Thanks for all the great work, NEAq! Thank you for noting that! I agree with you in your response. Sometimes we're not as great as checking the comments as we should be :P Thank you for your support!! !